More on Sir Charles and BISRA can be found in the biography. The authors of this CD-ROM produced in 2001 a major chapter on the History of the British Iron and Steel Research Association (BISRA) for the book, British Iron and Steel AD1800-2000 and Beyond, published by the Institute of Materials, Minerals and Mining. This chapter has been revised and considerably expanded for publication in CDROM format, which has allowed the inclusion of additional information and a large number of photographs. The CD is in two parts. The first shows how co-operative research evolved in the UK steel industry leading to the formation of BISRA in 1944. During the next 24 years, laboratories were established in London, Middlesbrough, Sheffield and Swansea, each focussed on a specific aspect of technology and the related basic sciences. The industry and government jointly financed the Association with industry providing an increasingly larger share over the years. BISRA became part of the British Steel Corporation in 1968 but continued to operate as a separate entity until 1971. In the second part, an extensive selection of research activities is presented to illustrate the work of the Association. Project areas described cover the whole of steel production route starting with blast furnace raw materials through to mechanical working and strip coating operations, and the development and properties of steels. The selected topics include projects that were commercially successful and those that were not. There is often much to be learned from the latter, where the research work receives less publicity and may eventually be forgotten. There are appendices with photographs of laboratories and open days; listings of staff; extracts from staff magazines; and photographs of social events. The photographs are from archive sources or have been loaned by former employees to whom we are most grateful. The management philosophy at BISRA is given special mention under its highly influential Director, Sir Charles Goodeve. 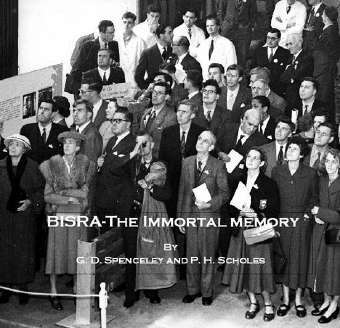 The Scientific Staff were recognised and supported as being at the core of a highly creative organisation and this has led us to entitle this monograph BISRA-The Immortal Memory. The CD has been produced privately and is available from the authors at a charge of 15 UK Pounds (20 Euros or US$25) to help cover costs and postage. Please contact one of the authors for details of how to obtain a disk. The CD with a searchable bibliography is priced at 15 Pounds.